Updated Tuesday March 19, 2019 by South Central Minor Baseball. This high-performance camp has two components to it that you can choose from. 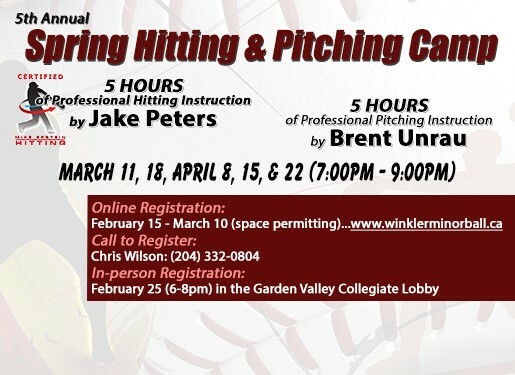 A hitting component run by Mike Epstein Certified Hitting Coach, Jake Peters, as well as a pitching component by former Jack Hind Award Winner (M.J.B.L Most Valuable Pitcher), Brent Unrau. Jake Peters has over 20 years of coaching experience in Fastball and Baseball. Jake has had the opportunity to coach several team in Provincials, Western Canadian Championships, and one team in the Canadian Fastball Nationals. Jake is also a Mike Epstein Certified Hitting Instructor and has instructed many local baseball players in his Hitting Lab, over the last five years. This componet consists of five 1-hour sessions. Brent has years of experience as a high level baseaball player, as well as over 15 years of experience teaching and coaching pitching and various other aspects of the game. From 2001 to 2004 Brent played in several colleges including Mayville State Dawson Community College, and in Wisconsin with Northland College. Following his succesful college baseball career Brent starred in the MSBL picking up player of the 2004 MVP award. Since then Brent has spent many years coaching young kids and high-performance baseball player, with his most recent stint with the South Central AAA Midget team as a head coach. Brent brings with him extensive knowledge on the "little things" about pitching and the fundamentals of this great game. Each participant will get a minimum of 2 slo-motion videos emailed to them - one from the stretch and one from the full. These clinics are open to all Major 13U (Peewee), 15U (Bantam), and 18U (Midget) players registered with Winkler Minor Ball for the upcoming season. There are 24 spots available.